During early remote control testing, I noticed that on occasion the software would perform the wrong function – for example I would push [Channel Down] and the number “5” would appear on-screen. This generally happened when I wasn’t aiming the remote absolutely perfectly at the infrared receiver. A mild nuisance, but troubling nonetheless. 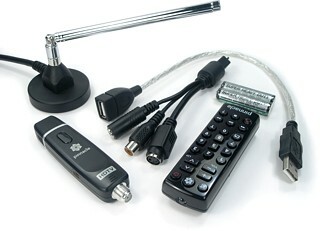 Once I started using the HD Pro with the rest of my home theater, it became obvious that the infrared receiver and/or its software driver are almost entirely indiscriminate in responding to IR codes – random functions occurred in TVCenter Pro no matter what device I was actually controlling. Sony, Toshiba, Pioneer, JVC – all of them had commands that would cause something to occur in TVCenter Pro. In the end I had to disable the remote control receiver (which thankfully is even possible) to finish testing, since it was becoming impossible to keep the software on a single channel. Unfortunately, because of this oversight the HD Pro will not be an ideal choice for home theater integration – at least not if you had any plans of using the integrated IR receiver. Despite a professional appearance and robust feature set, TVCenter Pro suffers from a number of bugs. I came across at least a dozen issues during testing, ranging from problems loading channel lists and on-screen displays that wouldn’t turn off, to an inability to surf past channels that had no signal strength at that moment. These weren’t the kind of problems that perhaps only a small percentage of the installed base might experience, but obvious ones happening in frequently used areas. For this reason I’m going to split my rating of the PCTV HD Pro Stick into two parts. First, the software. The bundled applications that come by default with multimedia devices are often considered “throw away” programs, used merely to verify that the hardware works before installing something else. Pinnacle’s TVCenter Pro actually has the potential of being a rather decent full-time TV application, but the bugs, EPG de-integration and awkwardness of using it by remote will hamper it from making the transition from “free” to “value added”. For occasional viewing, or users who just want some HDTV while travelling, TVCenter Pro is probably good enough. And as for that adorable little remote control… well, it’s tied completely to TVCenter Pro, so if you opt to use other software such as Windows Media Center both the remote and its quirky infrared receiver will be rendered non-functional. Second, the hardware. What can I say? This tiny tuner’s ATSC reception managed to put my big Sony HDTV DVR to shame. It fits in the palm of your hand, can plug into any Windows PC, and has a complete selection of analog, digital, SD, HD and radio capabilities to tune practically anything you want, anywhere. Pair the PCTV HD Pro Stick with mature and robust DVR software for a winning combination.